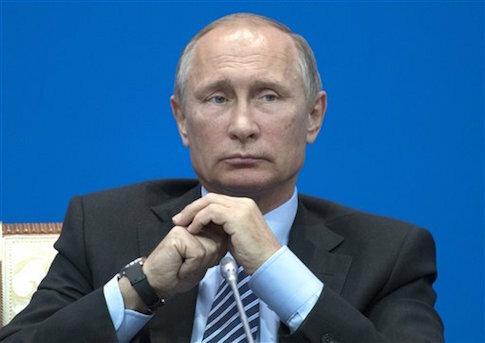 Russian President Vladimir Putin signed a directive Wednesday to pull Russia out of the International Criminal Court, or ICC, one day after the United Nations formally condemned Moscow's annexation of Crimea. The Russian Foreign Ministry said in a statement the ICC had "failed to meet the expectations to become a truly independent, authoritative international tribunal," CNN reported. The ICC is tasked with ruling on charges of genocide and crimes against humanity. Russia called the court "ineffective," adding that the its 14 years of work produced "only four sentences" while over a billion dollars was spent. Russia signed the treaty to establish the Hague-based court in 2000, but never ratified it. Kremlin spokesman Dmitry Peskov said the decree to withdraw was simply a formality given that Moscow never officially approved the court. ICC spokesman Fadi El Abdallah said in a statement that "membership of the Rome Statute is a voluntary and sovereign decision which is the prerogative of all states." "The ICC is respectful of each states' sovereignty," Abdallah continued. The U.N. General Assembly's human rights committee approved a resolution on Tuesday condemning Russia's "temporary occupation" of Crimea, accusing the Kremlin of human rights abuses such as discrimination against some of the region's residents. Peskov refuted the charges, claiming that Crimea joined Russia from Ukraine after a popular vote. Russia's withdrawal from the ICC comes as some African nations mull pulling out of the court following the departure of South Africa in October. This entry was posted in National Security and tagged Crimea, Russia, United Nations, Vladimir Putin. Bookmark the permalink.